Happy Homecoming Week, readers on TDM and the Magi Football Blog. I am Gir Todafunk, Mr. Wonderful himself, with another fresh weekly column. I love Homecoming. It's one of the distinctively North American traditions that take place in the fall. It all started in the University of Missouri at Columbia, in which they had this one football game that all former alums were invited to attend as a way to come back home to their alma mater. Pretty soon, every school was doing it, and ever since the first football season back in 2011, Mitakihara has had over four decades of Homecoming Weeks. M-Town is just bursting with Rose, Pink and White colors up and down, in and out, here and there and everywhere. I see plenty of ferries coming down to Mitakihara Bay to drop fans who are staying this week to enjoy the city and the campus. It's like one of those vacation weeks, those getaway weeks in the Fall. Well, that's for the alumni that want to come back and experience this place. As for me, I live here, and I've been to a lot of these Homecoming Games when I was young, so I know the pageantry, the grandeur, and all that. But what makes this special is the fact that they are honoring my great-granddad Neil. I was at the Postmeridie event at Nonaka House, and I did an impromptu speech. This is an approximate transcript of what I said. Excerpts, that is. "My great-grandfather, first and foremost, was one of the best guitarists of his era. He was also a great singer and a talented songwriter, and his lyrics touched on so many subjects. He could play a lot of other instruments, such as the piano and the harmonica. As a musician, he was the one that set the wheels in motion for the grunge rock gene, and with groups like Crazy Horse, CSN&Y, and Buffalo Springfield, Neil Young was a musical powerhouse. "He was talented at directing films, and his signature masterpiece as a film director was a documentary on the evolution of electric cars. But what really made my great-grandfather a man among men was his work towards promoting a better life for all in general. Farm Aid is one of his crown jewel projects and remains to this day as one of the most meaningful benefit concerts of out time. He also founded the Bridge School for children with disabilities, and also created benefit concerts for the Bridge School. "My great-grandfather earned so many honors during his lifetime: Order of Canada, Order of Manitoba, Rock and Roll Hall of Fame, Hollywood Walk of Fame, Canadian Music Hall of Fame, Juno and Grammy Awards, honorary doctorates...the list goes on an on. "But nothing, nothing comes close to being a recipient of the Postmeridie, which is given at the discretion of the University Chancellor, in this case, Dr. Madoka Kaname, for outstanding service to society and leaving an indelible impression on Mitakihara University which will last for generations to come. I am so honored to accept this award on behalf of my late great-grandfather, Neil Young, and our family. "I want to thank each and every one of you, from the bottom of my heart, for saluting and honoring Neil Young. Thank you all." And that was pretty much the speech, which actually felt more like a speech to me. I guess I'm not that good at impromptu stuff. It's because of this: as I understand it, Postmeridie is not something you can earn easily. You need to have a massive impression on the chancellor. It's like one of those awards handed by the British Monarchy for outstanding service. Honors system and all that stuff. So today, I'm going to be with the rest of the football team going through one final training session this week before heading to the Kirisame Pyramid to take part in the Pep Rally. The place will be packed, the Ultimate Pep Band will be there, all the coaches and admins will be there...so awesome. And I want to see you there, too. Pack the house. We need your support. This is YOUR university. We are YOUR team. So come out to Homecoming and show the world that You Are Not Alone. Don't forget, check out next week's Weekly Column, where I will talk about Nick Malceski and his lovely waifu. Yes, they are married. He's taken, ladies, I'm afraid to tell you. And no, she's not a pillow. 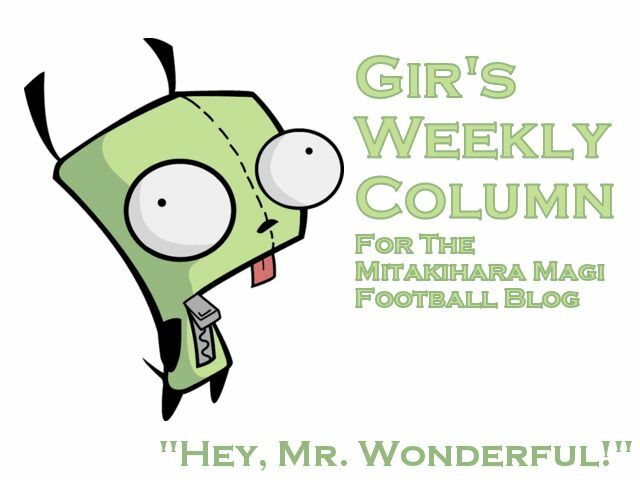 Till next time, this is Gir, Mr. Wonderful, signing off.